The archaeological site of Meu Jardim (municipality of Nazaré) is a shell-midden with several phases of occupation dated to the Middle Neolithic period. It is located near flint deposits, on the Atlantic seaboard of the Portuguese Estremadura. Its excavation, that took place in the context of salvage archaeology, was due to the building of a bridge. The fieldwork consisted of the excavation of three tests, comprising a total area of 102 m2. Given the gap in knowledge that dominates the lithic studies of the Middle Neolithic period, it was decided to analyse its blade and bladelet productions (from Tests 1 and 3, where the lithic assemblages are more abundant) and integrate them in their regional context. In order to allow for the establishment of systematic inter-site comparisons, an explicit methodological option was the use of the same analytical protocols as employed elsewhere in the study of coeval sites in the region. These protocols consist mainly of the adoption of the proposals initially put forward by Tixier et al. (1980), which were adapted by Carvalho (1998a; 2008) to the Early and Middle Neolithic periods in Portugal. Overall, the knapped stone assemblage from Meu Jardim totals 639 artefacts of locally available raw materials (flint, quartz and quartzite), which form an assemblage composed of cores and core maintenance products, flakes and debris, blades and bladelets and retouched tools. Flint is the most used raw material, which is due to its availability in the area surrounding the shell-midden. It should be noted that flint is an abiotic resource that can be found almost everywhere in Estremadura but it may be absent from more restricted areas within the region. This fact impacted the acquisition strategies during the period. In the case of Meu Jardim, this implied an expedient exploitation of the nearest flint sources to face the needs of short stays at the site, and the abandonment of nodules and cores in their early stages of reduction. The so-called “prismatic method” (see definition in Carvalho 1998a) was employed for the production of elongated blanks. On average, these ranged in 1.8-7.0 cm in length, 0.5-1.4 cm in width and 0.2-0.9 cm thick, thus forming a bladelet-sized assemblage. The knapping techniques may have been comprised of pressure and indirect percussion; however, according to published experimental evidence, the former technique seems to have been dominant. Indeed, the overwhelming presence of overhanging accidents, regular edges and ridges and faceted butts along with the small sizes evidenced by these blanks strongly points to this conclusion and suggests the presence of hand-knapping procedures (i.e., without the use of levers or similar devices). Tools types are composed mostly of side-retouched blades and bladelets; notches, denticulates, perforators and truncations are less well represented. Microliths were not found. Contrasting with the relatively robust evidence available for the Early Neolithic period in Estremadura, little is known regarding the later stages of the period. The most evident feature is likely the increase in sizes of elongated blanks that is recognized in many assemblages dated to the Middle and Late Neolithic. The morphometric and technological study of blanks from Middle Neolithic cemeteries in the region have reveal two main size groups: one of smaller sizes (2.5-10.0 cm in length, 0.8-2.0 cm in width) and a more robust one (12.0-18.0 cm in length, 1.8-2.8 cm in width). One attribute also marks the difference between the two: the absence of heat treatment in the latter group. Up to now, the evidence from habitation contexts is less clear due to the lack of studies. However, all seem to indicate that at other habitation sites the elongated pieces are similar to those identified at Meu Jardim. A factor that introduces more variability in morphotechnic features is the presence at some sites of bipolar knapping for the production of very small and irregular bladelets, the so-called “bipolar method” (see definition in Carvalho 1998a). In these cases, larger blanks likely imported as finished products from sites located near flint sources are found along with the locally produced smaller, irregular ones. This strategy was not observed at Meu Jardim; indeed, this site is testimony of the opposite situation. 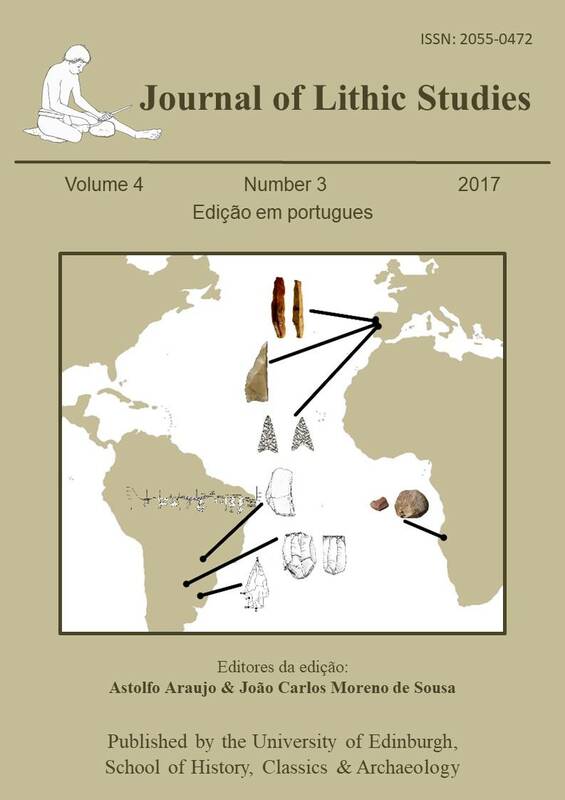 Overall, these inferences reveal a pattern of highly diversified economic and technological behaviours regarding flint exploitation and exchange in Middle Neolithic Estremadura.